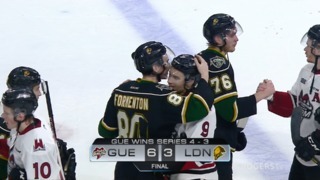 If London Knights captain Evan Bouchard winds up playing this season in the National Hockey League, his last appearance in a London Knights uniform was filled with the skill and class that have been the trademarks of his major junior career. Bouchard scored a goal and added an assist in a 4-1 victory over the Sarnia Sting to open a four-game preseason for the Knights. While Bouchard played offensive catalyst, London goaltender Joseph Raaymakers took care of things in the defensive zone as he stopped three breakaway chances and 26 pucks in total. Bouchard opened the scoring in the first period with a low slapshot from inside the blue line that beat Blair Coffin of Sarnia. The Knights outshot the Sting 20-6 in the first period. 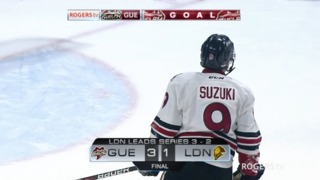 Billy Moskal took a feathery pass from Bouchard and converted on a well-placed backhand to put London ahead 2-0 just one minute and 20 seconds into the second period. Matthew Timms added the other assist. The Knights acquired Timms from the Peterborough Petes right before the start of training camp. 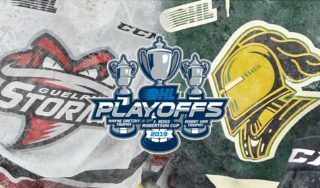 The Knights grew their lead to 3-0 late in the period on a powerplay as Matvey Guskov sent a puck to the Sarnia net that Cole Tymkin and Connor McMichael took whacks at until McMichael knocked the puck across the goal line. Maple Leafs draft pick Ryan McGregor took a pass from Will Redick on a 2-on-1 and broke Joseph Raaymakers’ shutout bid at 5:58 of the third period. Evan Bouchard took the ceremonial face-off for the Knights on Friday night. He scored the opening goal of the game using a very familiar low slapshot, set up London’s second goal and was named the game’s first star. That was the Knight captain’s final appearance at Budweiser Gardens before he heads to training camp with the Edmonton Oilers to try to crack the National Hockey League at 19 years old. The easy question is, “Has Bouchard played his final game for the London Knights?” That is a question that only Edmonton can answer. There is still a great deal of competition for roster spots on the Knights that will play out over three more preseason games. In goal, London is down to 20-year-old Joseph Raaymakers and 18-year-old Jordan Kooy. That is the most set position on the team. 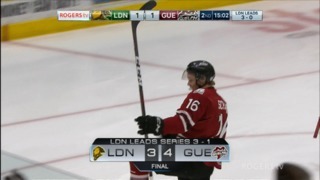 London has 12 defencemen and 18 forwards and 22 of them have OHL experience. The Knights and the Sting will meet again on Saturday in Sarnia. That game will likely see the debuts of some London youngsters. The 2018 draft selections, Luke Evangelista, Antonio Stranges, Sahil Panwar and Gerard Keane were able to watch Friday’s game, but may all play against the Sting. You will be able to hear the broadcast of the game at www.980cfpl.ca beginning at 6:30 p.m.